Greek and Norse mythology meet in this new adventure starring Demon, the half-god Beast Keeper of Mount Olympus! Mount Olympus is preparing for the arrival of some special guests: the mighty gods from Asgard in the North. And it seems that Odin, the ruler of the Asgardians, has an important mission for Demon. Goldbristle, the gods’ prized shining boar, is losing his light. Now Demon must travel north and search this cold, snowy land for anything that might cure him. 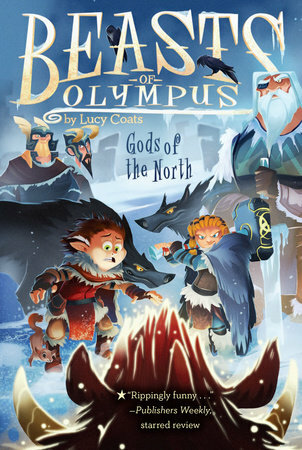 The latest installment in this chapter book series by Lucy Coats blends elements of mythology, fantasy, animals, and adventure with plenty of humor and heart. Demon secretly breathed out a sigh of relief as he waved farewell to his teacher. The centaur headed off down the steep slope of Mount Pelion. Chiron carried a large bundle in his arms that was cooing and gurgling. Baby Hygeia was all cured now, so he was taking her home to her parents at last. Demon could finally get on with a full day of quiet studying. Babysitting, he decided, was a very tiring job. He much preferred looking after his beasts. However, Chiron liked him to write up his notes on each case. First of all, Demon put on his pink-tinted opticles and got out the beautiful red-and-gold leather journal that the goddess Athena had given him for saving the phoenix. He sucked on the end of his quill for a moment and then began to form careful letters on the page as the pink light of dawn lit up the cave. Babies: How to Look After Them, he wrote. But before he could get down another word, there was a whooshing sound outside the cave. A wisp of multicolored light snaked in and tapped him on the shoulder. This time, Demon’s sigh was loud and impatient. It was taking much longer than he’d expected to teach his brand-new assistant all the stuff he needed to know about the Stables of the Gods. With Demon needing to explain everything about a hundred times, it was all taking twice as long as it should have. “What’s he gone and done now?” he asked rather wearily as he climbed aboard. He wasn’t sure he was cut out for being a teacher. “I believe the griffin mentioned something about a bull fight and a pen on fire.” Demon closed his eyes and clenched his jaw. This was the third incident in as many days. The two brass bulls were becoming a pain in his neck. “You’d better hurry, Iris,” he said. “Hold on to your hair, then,” said the rainbow goddess as she whisked him up and away to Olympus. Demon pulled a neatly folded packet out of one of the rather messy drawers in the hospital shed and pointed to it with a stern finger. Bion hung his head. Half the curly hair on his head was singed and smoking slightly, and one arm was red and burnt-looking. Just as they were persuading a reluctant Khalko to enter his new fireproof pen, there was an unusual uproar outside. “Hey, Pan’s scrawny kid,” said a familiar voice. “Come quick—something’s happening!” It was the griffin—and its orange eyes were blazing with excitement. Demon latched the pen firmly, and then ran out with Bion. Something was indeed happening. A chattering commotion came from a group of nymphs and cherubs hovering around a stranger who was clad in a long cloak of white furs and carrying a golden horn that twisted around his whole body like a giant snake. His hair was also white, and his white beard was plaited into three jutting forks. As Demon came closer, he saw that the man’s eyes were the pale white-blue of an early winter sky. “Who in the world is that?” he whispered to the griffin. The stranger put the horn to his lips and blew. It made a sound like no other Demon had ever heard, and suddenly his skin prickled as if he’d been dipped in deep black water on the coldest-ever winter day. Then the stranger began to shout, and his voice filled the whole of Olympus. “Hear me, hear me, O mighty Zeus. I am Heimdall, herald of Asgard, and I am sent to bring you news from the North.” As he spoke, there was a crash of thunder, and Zeus appeared, with Hera beside him. As lightning flashed around them, and the sky darkened, the nymphs and cherubs all scattered, and Demon shrank back behind a nearby olive tree. The griffin and Bion skulked in behind him. “And what news is that, O herald of Asgard?” Zeus said, his voice booming just as loudly. “Why, the best of news,” said Heimdall, baring his golden teeth in a grin like a shark Demon had once seen down in Poseidon’s realm. “The gods of the North are coming to visit you. It’s party time! See ya later, Thunder Maker!” And then he disappeared in a blast of icy white light, leaving behind a large scroll fluttering through the air, and a huge pile of what looked like man-size stone jars. “Well,” said Hera, snatching the scroll and peering at it before thrusting it at Zeus. “I call that very rude. Inviting themselves to stay like that. Who do these Northern gods think they are?” She swept off, back to her palace, muttering, and Demon shrank even farther behind the tree, hoping she wouldn’t see him. The queen of the gods wasn’t exactly known for her sunny temper, and he didn’t fancy being frazzled to a frizzle before he’d even seen what these new gods looked like. Zeus frowned as he read the scroll, and as he stalked forward to examine the stone jars, a low mutter of thunder growled overhead. Picking one up as if it were a feather, he wrenched off the top with a pop and then looked inside, sniffing deeply as a cloud of foam spilled over the rim. Then he swung the jar up to his mouth and took a cautious swig of whatever was inside. All at once, a change came over his face. He took a great gulp, then another, and another. “Ahhh,” he sighed, wiping foam off his beard and setting down the empty jar and picking up another. “Mead! Delicious. Almost better than Dionysus’s grape brew.” Straightening up to his full height, his eyes swept around Olympus, finally settling on Demon, who automatically began to quake with fear. But whatever Zeus had drunk seemed to have put him in a good mood. “Y-yes, Your Mighty Thunderousness,” Demon said, dropping to his knees. Then a thought hit him. “Er, do you mean I’m to tell the other gods and goddesses, too?” he asked cautiously. Zeus laughed. “Hera will have let most of them know already, but you’d better pop up to Hephaestus’s forge. He never hears anything if he’s banging about with those great hammers of his. Hurry up now, young Stable Master. There’s no time to lose.” With that he picked up yet another of the enormous stone jars and set off after Hera, humming a tune that sounded like stars grinding against each other. Demon looked up at the sky. Helios’s chariot didn’t have much farther to go before the sun would be right overhead. Panic was starting to sink in when the griffin poked him in the back with its sharp beak. “And I’ll tell the fauns from the kitchen,” said Bion rather squeakily. An encounter with Zeus tended to make almost anyone a bit squeaky, Demon had found. Thanking them over his shoulder, Demon ran as fast as he could up the mountain to find his old friend the blacksmith god, Hephaestus. Taking a quick look to make sure the dragon-mode danger sign wasn’t anywhere in sight, he leaped over the Colchian Dragon’s purple tail and ran into the dark, sooty cave. He followed the ringing sound of hammer on anvil to its source. Hephaestus had a grimy rag wrapped around his sweaty forehead, and he was battering away at a long sword that glowed cherry red from the heat of the fire. Demon jumped up and down to get the smith god’s attention, and after one last mighty blow, Hephaestus plunged the sword into a nearby water trough, causing an explosion of hissing and steam. Muttering, the smith god put down his hammer. “Don’t eat all the charcoal while I’m gone,” he said to the dragon. But it took no notice, snoring quietly in the corner on a pile of golden armlets. Panting even harder and running to keep up with the god’s long strides, Demon explained. And as they got nearer to Zeus and Hera’s palace, the sound of a great crowd rose to greet them. And then, with a golden flash, Zeus was on the balcony above them with Hera and all the other gods and goddesses crowded in behind him. He held up a hand, and immediately there was silence. “NO!” came the reply, so loud that Olympus shook with the force of it. “You’ve got some tidying up to do, Pan’s scrawny kid,” said the griffin, reaching out a claw and patting some mucky straw blowing about. Demon looked around. It was true. The Stables weren’t as immaculate as he would have liked. There were cobwebs in some of the corners, and Doris the Hydra had dropped a messy trail of ambrosia crumbs on the floor. He sniffed. There was also a distinct smell of burnt hay, mixed with a bit of a pooey stench. “Come on, Bion,” he said. “Let’s find the buckets.” But Bion was staring at something over Demon’s shoulder. All at once, the faun gasped and fell flat on his face. Zeus was standing right there, leaning against the huge door frame. Demon’s knees began to tremble. This was definitely not the happy Zeus of earlier that day. He was rubbing his temples as if he had a headache. The king of the gods scowled, and Demon braced himself. Was this it? Was Zeus going to zap him into charcoal at last? He squeezed his eyes shut and hunched his shoulders tightly around his ears, waiting. “PANDEMONIUS!” The great booming voice rang out, making Demon’s eyes pop open despite his fear. His mouth was as dry as an empty well, but he forced himself to speak. Zeus bent down and picked up Demon with one thumb and finger, so that he was dangling just in front of Zeus’s nose. Demon didn’t dare move, terrified that Zeus was going to drop him. The god glared at him. “DO I MAKE MYSELF CLEAR?” he barked. Demon found himself nodding so hard, he thought his head was going to drop off. Without quite knowing how, he found himself on the ground again, all in a heap. Zeus was nowhere to be seen, Bion was sobbing in a corner, and even the griffin had its wings over its eyes. His mind ground to a halt suddenly, remembering, and his stomach dropped like a stone. All the winged horses were down on earth. Iris had refused to carry them ever again after they pooed all over her. He had no way of getting them back up to Olympus. “Do about what?” asked the griffin. “Sounds like you’re in trouble again, Pan’s scrawny kid,” it said, yawning. “I’m off for a nap. Gods make my beak ache. And if you think you’re roping me into this aerial performance thingy, then think again.” With that, it stalked off and lay down in its pen, all four paws in the air. Demon nearly hugged him. Golden Dog had the strange ability of slipping through the cracks in time and space, and he could take people along with him. Unfortunately, Golden Dog was not in his usual place, curled up with the magic nanny goat, Amaltheia. “Can you call him back?” Demon pleaded. “It’s really urgent.” The old goat butted him in the leg. “I’ll try,” she said. “Because it’s you, young Pandemonius. But mind you get one of those nice nymphs to come and comb out my curls for me.” She closed her eyes and let out three high, clear bleats, then three very low ones. Almost at once, there was a distant bark, sounding as if it were coming from the end of a very long tunnel, and then, in a frantic flurry of legs, waving tail, and tiny golden stars, the dog appeared out of nowhere. Once all the usual ritual of bouncing and jumping up and snuffly licking of faces was done, Demon explained what he needed. Demon had done this before, but the dizzy, whooshing sensation still made his stomach feel as if it were falling out of his feet. Within less than a breath, though, he was stumbling onto the sunny slope where the winged horses liked to graze. As he and Golden Dog appeared out of nowhere, the herd whinnied in alarm and took off into the air. “It’s all right,” Demon called to them. “It’s only me!” Slowly the little horses settled to earth again, and Keith, the boss horse, trotted up to him, his daughter, Sky Pearl, behind him. “Oh!” said Demon. “When did you get back?” He’d left Sky Pearl with his friend Prince Peleus in the Mountains of Burning Sand after their adventure with the phoenix. He turned to Golden Dog, keeping his fingers crossed that the idea would work. the short journey, Helios had nearly driven his sun chariot over the horizon. Demon and Bion brought them a big barrowful of unburnt sun hay. Demon lay awake under his spider-silk blanket. He and Bion had started in on scrubbing every inch of the Stables before they went to bed. His body was exhausted, but his mind refused to shut down. Magnificent and memorable was what Zeus had demanded. But how was he going to make sure his aerial display was both? “Whaa . . . ?” murmured Bion sleepily from the next-door pallet. “Never mind,” Demon whispered. Eventually, he dozed off, but his dreams were full of wings and fire. The next morning, he set Bion to boiling up a small pot of peppermint leaves and honey for Sky Pearl’s sweeties, and a much huger pot of eucalyptus leaves, lemons, and pine needles. “We have to make the poo chute smell nice,” he said. “This should do it.” He wasn’t sure that the hundred-armed monsters at the bottom of the poo chute were going to appreciate the nice smell much, but they’d just have to put up with it. When he arrived at the paddock, the winged horses were in an excited huddle of wings and hooves. “Look, De-he-he-mon!” Keith whinnied. Whirling around, he and Sky Pearl set off at a canter, one swerving left and the other right, with half the herd following each of them. They soared into the air and began a complicated series of loop-the-loops and spirals high in the sky. Then they came together behind Keith in a big V and swooped down low over Demon’s head, so that he was nearly knocked over by the breeze of their wings. “Amazing!” he yelled. But it was still not quite marvelous or memorable enough. How could he make the display good enough that Zeus wouldn’t spike him with a lightning bolt? Suddenly he remembered his dreams of the night before. Wings . . . and fire. “Keep practicing!” he called. “I’ve got an idea.” And he started to run up the mountain toward Hephaestus’s forge. The forge was buzzing with activity. Golden automatons were running about everywhere, and the place was full of heat and sparkle. Piles of purple and orange fire-jewels lay everywhere, along with rubies and pearls and all manner of other gemstones. Hephaestus hunched over a delicate piece of jewelry, alternately teasing out strands of gold with a tiny pair of tongs and tapping them with a small silver hammer. “Can I borrow the Colchian Dragon, please?” Demon shouted. “Take him with pleasure!” Hephaestus said, not looking up. “We’re all tripping over him. You’d be doing me a favor. I’ve got to make enough jewelry for all the goddesses, as well as gifts for all our visitors.” He wiped a sweaty hand over his forehead and started tapping again. “What do you need me for?” asked the dragon, snatching up a last mouthful of charcoal. His bright purple tail made a slithery sound on the rocks. “You’ll see,” said Demon. He crossed his fingers as he spoke, though, because there was a big danger that it could all go horribly wrong.